If people knew how to invest properly, everyone would live with a better state of mind. With that notion, I have decided to start a new blog with my cousin Mark, to teach regular folks how to setup an investment account, invest properly by setting up your portfolio smartly and grew a retirement nesting egg. 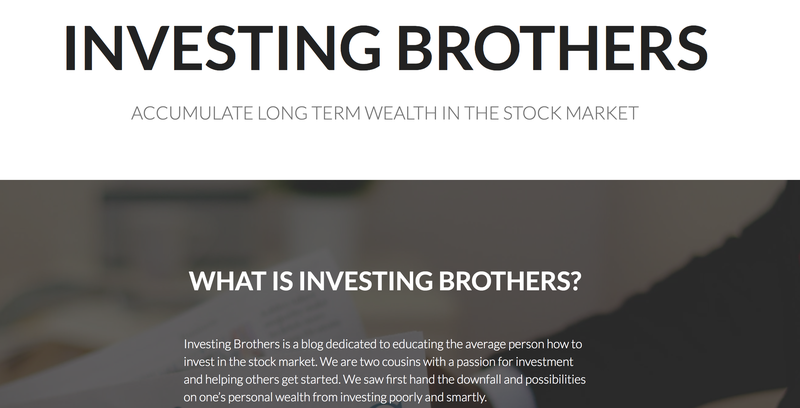 This new blog is called Investing Brothers. Head over to our site and let me know your thoughts! I am fat. Rather, I was fat. I was not obese but I was not skinny nor healthy either. I was getting close to obesity and I was hitting record weight early this year. But I went through a life impacting moment and had a chance to reflect upon myself. From the self-reflection, I decided to change for the better. I decided to go on a diet. 1. Stress. Stress from lack of job, stress from joining a growth hacker bootcamp, then stress from working at an early stage startup. This is probably the biggest factor to my weight gain. 2. Lack of activity/movement and poor eating choices. I was driving to San Francisco to work every weekday which is about 2–2:30hr per day of commute. This left no room for workout as I left home very early and only got home late at night. Because of the lack of time and the combination of stress, I was just eating unhealthy and drinking a lot whenever I could. 3. Lack of rest. Because of the hectic schedule, I compromised on rest. I rested over the weekend but it never felt that it was enough of a catch up, to make up for the week. And so… I became fatter. I think I was 180 lbs/ 81kg at my heaviest. After getting laid off in March, the stress that felt like a huge burden over my shoulder came off and my weight stabilized. I remember going biking the weekend of my layoff and noticing that I’ve felt free and energized for the first time in over 6 months. No red meat. Yes to tofu and fish. Chicken very rarely. No processed carbs aka refined carbohydrates. Rice is ok (brown rice is best) and eat plenty of veggies. She doesn’t drink alcohol at all. 30 mins of daily activity. Because I was not working, it was easy for me to pick up this diet. I went biking every morning starting in April until my flight to Paris. I made congee (rice porridge) almost every day and I was eating that with veggies, fermented tofu/soybean and soy sauce. I eventually ate less and less and it started showing very minimal results by the wedding time (I knew I weigh less but the physical appearance did not change much. 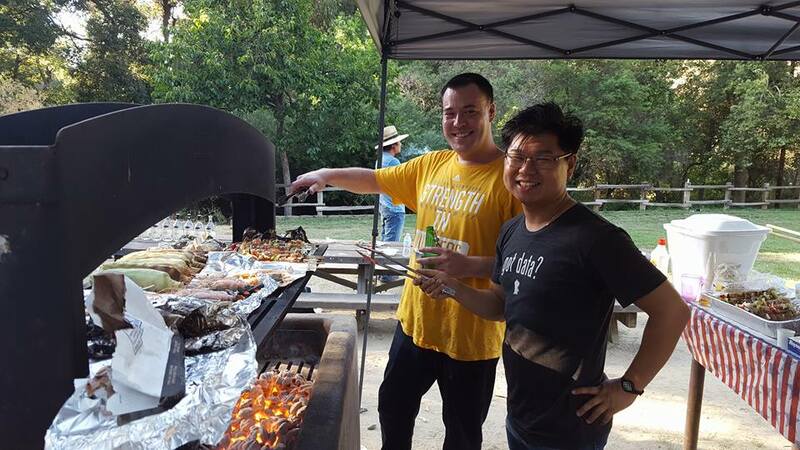 At least to the people at the wedding who knew me when I was skinnier in HK, I was still fat). Left Photo — May 22, 2016. My friend Vuthy visiting from HK. Look at my huge belly! Right Photo — This is where I go biking almost every morning since the start of my diet. Wake up, eat a banana or yogurt or cereal. Became lactose intolerant after moving back from HK so did not drink milk. Go bike ride in the morning for 45–60 mins at Vasona Lake. At first I would start at 9am. Gradually I started earlier and earlier. Usually Monday through Friday. After biking, I would go get a cup of coffee, an ice latte (and later just ice black coffee) and either go home or work from coffee shop until lunch. I went back to looking for a job and spend most of the day doing so. I might have an bowl of por (plain with soy sauce, rice seasoning and fermented tofu) or a fruit around 10–11am If I was feeling hungry. I included rice in my diet and ate plenty for lunch or dinner. My reason for eating rice is simple. Being Asian, I grew up eating rice since I was old enough to eat. My body had accustom itself to rice and only feel truly full after a bowl of rice. Over 2 billion people eat rice in Asia and they don’t have an obesity problem like Americans. Cut out all red meat. Chicken once in a while. I was eating mostly rice and veggies and the occasional seafood/sushi. Nothing processed so no hot dogs, no pizza, no junk food. Cut out most processed bread and chose whole wheat/grain when I was left with no choice (such as going camping in Yosemite and making breakfast for the group). I ate noodles once in a while. Drinking plenty of H2O (my body stores water since my chins get fatter when I don’t drink water). I choose veggie options when we went out to each. Veggie pho, veggie burger, veggie wrap, tofu options even if everyone around me was eating chicken or burgers. The one thing was that I was consistent. I never cheated. I only had a short amount of time until the wedding! I ate enough to fill me up but not over. I didn’t starve myself. Yes, I ate less and less as I progressed through my diet but I didn’t starve. This concept is very important. Starving yourself is going to make you gain the weight back and more. Intentionally fasting is different. Early dinner around 6pm. If I was hungry late in the evening, I would eat a fruit or greek yogurt with chia seeds. No more instant ramen as I used to do. Overtime my meals became smaller and I ate later each day. What I didn’t know then, was that I was practicing my own version of Intermittent fasting. It felt limiting at first but one quickly gets used to it as you follow a routine, know which places you can eat at and what options you can go for. My Paris trip for Socrate’s wedding and visiting my relatives. A short visit to London to visit my cousin Celine. My diet was on pause for the duration of the trip. Surprisingly I did not put on any pound after my return (I also came back sick) and had to go to Seattle the day after I came back from Paris. After coming back from Seattle and having gotten used to the diet , I continued on. It wasn’t hard since I was on it for the last 3 months. This time I was researching and watching a lot of youtube video about health, diets and cooking. I saw how food was made and how much butter, oil, fat was used in cooking meals which made me eat at home more (such as rendering fat to make steak taste even better). I was drinking less and had broken up with my girlfriend prior to the trip, which meant, I ate out less and lower the possibilities of eating unhealthy food. My weight loss was slow and steady. That is one thing people need to understand, results come with effort at a steady pace. There is no such thing as miracle diet (one that is legit and natural at least). I felt better but didn’t measure myself so I didn’t know how I looked to outsiders until I went on a bike ride up the hill with my cousins mid-June. Since I was biking and doing cardio in the morning, the ride up the mountain, called QuickSilver, wasn’t too tough. The people who rode with me complimented how well I did and how much weight I had lost which might have contributed to my ride efficiency. “You look like you lost a lot of weight since our ride beginning of the year.” Not only did I show physical change but I felt better too. I felt more energized and refreshed. Slowly July came around and getting to 30 was depressing because I felt I was behind in life compared to others who turn 30. July 4th Independence Day Party. Didn’t have much BBQ. The week of my 30th birthday, I came to the realization of a big motivational factor and a life changing thinking. I can’t control who hires me and I can’t control who I end up with in life. But the one thing I do have control over, is my health. Being healthy became my own personal goal. I needed a personal goal that was separate from my professional and relationship goals. Something I did only for myself. This goal isn’t to impress some chick or my boss or my family. It was something I wanted to do for me. Losing weight is simple. Consume less calories than you use; a calorie deficit. However getting to that answer isn’t simple. It is also about what you eat and when you eat. I’ve found that for myself, a 20% calorie deficit seem to be around a good range for weight loss while eating all the macronutrient you need. Not all calories are created equal. 1 calorie from protein isn’t the same as 1 calorie from a cup of oil or 1 calorie of veggies. Check out this short Ted-Ed video: What is a calorie? Diet and exercise are lifestyle choices. An investment for the future. Like all investments, you see results after letting it nurture itself over a period of time. Your willpower and personal choice are your greatest strengths. Self motivation are the biggest factors. Health and fitness experts are moving away from using calories when teaching about dieting and eating. Remember the simple weight loss formula; consume less calories then you use? Well the bad news is that you can’t lose weight if you keep eating junk food even if you reduce the amount of total calories you intake per day. I learned the new diet term, macronutrients or ‘macros’, which is according to Merriam-Webster: a substance (as protein or carbohydrate) essential in large amounts to the growth and health of an animal. Macronutrients are a simplistic way to look at the food you consume. Its broken down into 3 categories: proteins, dietary fats and carbohydrates. The 3 essential components of what you need to consume to be healthy. The irony from my readings; vegetable is considered a carb and the term “Simple vs Complex carb” or “refined and unrefined carbs” are often confused. To understand carbohydrates, watch this short video from Ted-Ed: How do carbohydrates impact your health. 1. Eat right. He makes his clients eat mainly brown rice, chicken breast and broccoli. No alcohol at all. 2. Train and workout right. 3. Rest & Sleep well. Can’t have a good diet without a rested body. One Youtuber, Radu Antoniu, caught my attention with his videos about fitness, eating and strength training. His videos are insightful because he adds facts and logic behind it. I ended up learning about Intermittent Fasting through his video. I’ve read about skipping breakfast in the past and often used to do it during college days but he convinced me through logic and examples. One of his video became my motivational factor and sprung me into action; “How to Stop Cheating and Get Lean for Good”, a video about discipline, habits, behavior control and auto-suggestion. I have watched this video over and over. Radu suggest to a trick to create a habit, an auto-suggestion by two methods: a goal card and following and watching fitness (or motivational) role models. The goal card is an ideal taken from speaker Bob Proctor, to remind yourself what your goals are. As you begin to see and read your goal card daily, it becomes a subconscious goal. Your conscious mind can focus on something else while making better eating/exercise an earlier habit to maintain. My goal card: lose weight get ride of debt. I read it every day. 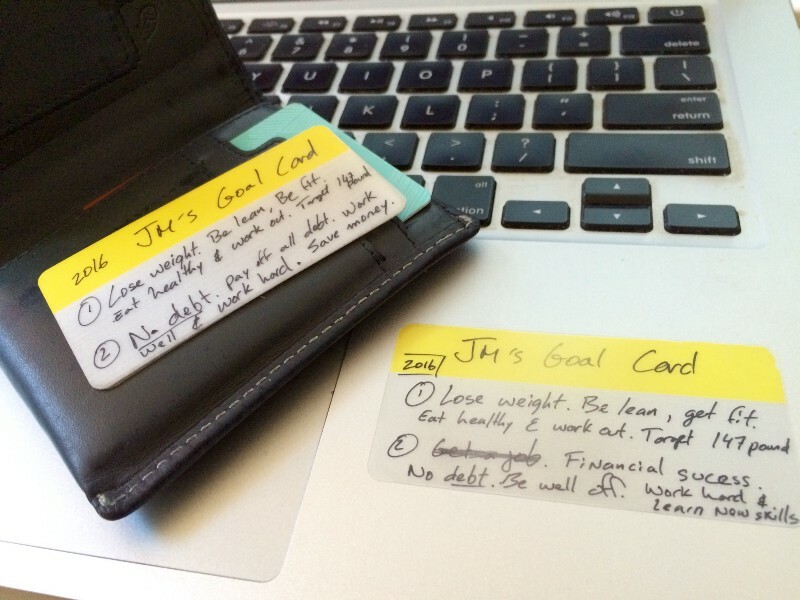 My goal card is tucked away in my wallet and in my laptop, the two items I carry with me only a daily basis. Lose weight. Be lean, be fit. Eat healthy and work out. Target weight = 147 pound. Get a job (old goal). Lose debt, be well off. Work hard and learn new skills for financial and professional success. The goal card may seem silly but it cost you nothing and the benefit could be life changing. The great thing about the goal card is that it can always be updated for new goals. I continued to watch Radu’s video and learned that he started his fitness journey from joining another program called The Aggressive Fat Loss Program by Kinobody. Greg O’gallagher, the owner of Kinobody has a YouTube channel which contains a lot of what people should be doing to start getting lean and muscular. I ended up buying the Kinobody Aggressive Fat Loss program by finding one of his landing page with a big coupon discount (yay growth marketer in me!). Its built around intermittent fasting and a workout routine. I was already fasting from having an early dinner, but took it a step further with Greg’s program and Radu’s videos. The underlying open secret for Radu and Greg’s program is a combination of intermittent fasting and a specific workout routine. Intermittent fasting is a pattern of eating when you force the body to prolong a fasted state and reduce the time spent in the feasting state. It allows your body to control the amount of new fat produced by using the old storage when you are fasting. Intermittent fasting has become popular as of late with noticeable results. It is not a diet and it is not for everyone. Read The Beginner’s Guide to Intermittent Fasting by James Clear for a good introduction and the many variation of IF (5–2, 6–1, alternative day, weekly etc.). Be sure to consult your doctor while carefully listening to your body. I’ve found it to be very effective for me and while there are many different variation of intermittent fasting, I implemented a 16 hour fast and 7–8 hour window consuming only coffee and water during my fasting period. My routine previously was enjoyable because I was not watching the clock but actively listening to my body of when it was really hungry (or just needed a quick snack) and full. It was however, very similar to IF in terms of timing so adding a more stricter schedule was not all too different and the results started showing signs around mid-July. I like to joke that It was a 6 month journey after all, trying what works, what doesn’t and what I felt my body was best doing. The Kinobody program is a form of intermittent fasting combined with calorie counting. At first, the program suggest eating the food you normally eat with one meal larger than the other, and slowly lowering your caloric intake to reach your desired weight. I choose to maintain my dietary routine and ate just I have been for the past months. In a way, I’ve slowly adjusted my timing to match a full 16 hour fast — 8 hour eating window by starting slowly and pacing myself. The one aspect of the Kinobody’s Aggressive Fast Lost program that I did not follow was the workout regimen. I did not have a gym membership so I took to biking to get my cardio workout done. I was training for the Levi Gran Fondo, a charity ride across Santa Rosa October 1st that was 60 miles of road cycling with almost 4000 ft of elevation gain. I found cycling to be the most enjoyable way to exercise for my lifestyle and diet (training for the ride was an added bonus). 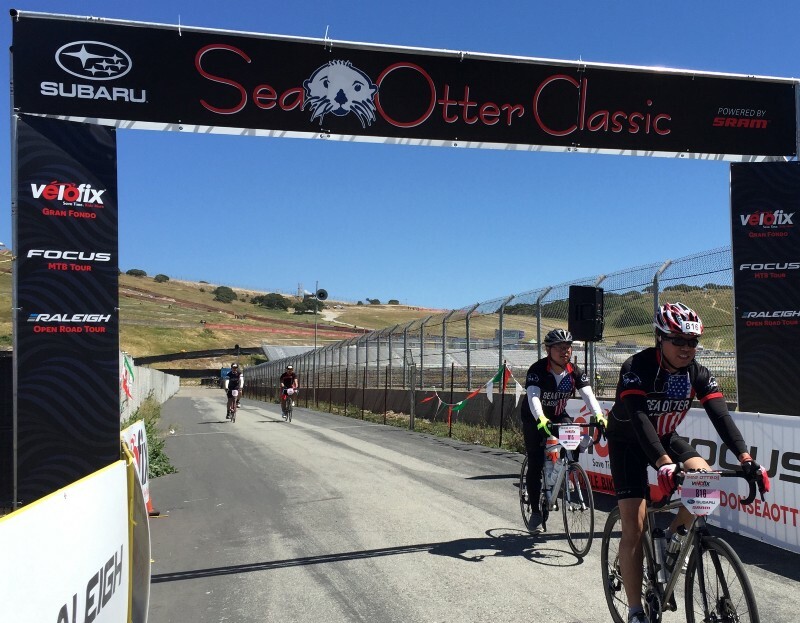 Me crossing the finish line for the Sea Otter Classic in April 2016. I’ve made biking part of my lifestyle. This ride was during the start of my diet. Wake up at 6am and go biking for 30–40 mins. I bike the same distance as before but because I am getting more efficient at biking, It takes me less amount of time to finish. I increase difficulty by not changing gear and trying to ride as fast as I can. I go to sleep around 10:30pm. Drinking TONS of water all day long. Sometimes coconut water as a treat and sometime sparkling water. It helps to fill you up as well. Coffee after my bike ride as part of the mechanism to blunt hunger. Lunch around 12 or 1pm. Meals include: congee, chipotle burrito bowl, salads, rice and an omelette. I’ve added a little bit of fat (yum to avocados!) and protein. I’m eating to my full potential or until I feel satisfied. Fruit or greek yogurt (with chia seeds) in the afternoon. I go out with friends Friday night. Yes I try not to overdo it but I understand going out means eating and drinking unhealthy. I just have to account for this when eating for the day. In August, I joined a new company and sometimes have only time for biking 3–4 days a week. I sometimes walk around the neighborhood after dinner If I feel too full for about 15–30 mins. I feel that walking after eating helps me digest better. I try to eat around 6:30–7pm at night. My meals include white or brown rice, some sort of veggies and chicken or tuna salad once in a while. Weekend work at our family’s shop so I’m waking up at 6am everyday of the week and maintaining the 16ish hour fasting. Some days I eat earlier, some days later. It depends on what my body is telling me. I work 7 days a week so I’m confident most people can do this If I’m able to. Dieting should be about tailoring other people’s advice to what your body is telling you. There is no perfect diet program that is tailored for everyone. You have to take all the good from each of them and adjust accordingly. It will take time, patience, testing and perseverance. Read your goal card everyday. Efficiency Tip: Got an morning workout routine like me? Instead of listening to music, listen to audiobooks and podcasts to absorb even more knowledge while exercising. I’m currently listening to “Grit” by Angela Duckworth. The Leangains Guide by Martin Berkhan. My Intermittent Fasting Lifestyle: How I Dropped 50 Pounds by Sumaya Kazi (She does the 4:3 IF). The Misunderstood Psychology of Weight Loss — how to lose 30 pounds in 2016 by Mitchell Harper (I especially like his “why” section). The Fast Diet by Michael Mosley. Integrative Physiology of Fasting by Stephen M. Secor & Hannah V. Carey — Wiley Online Library. The path of researching all I could about Intermittent Fasting let me to a fitness podcast called Fitness Confidential with Vinnie Tortorich. 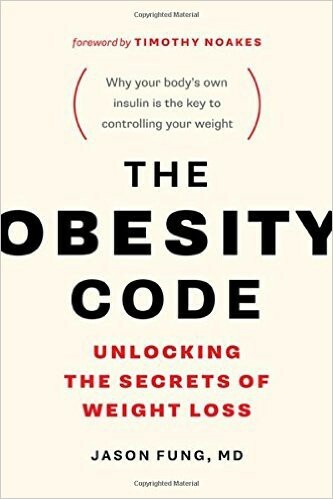 Vinnie mentioned a book he liked named The Obesity Code by Dr. Jason Fung. Intrigued, I bought the book from Amazon and I highly recommend it. 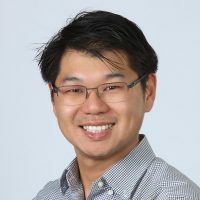 The Obesity Code by Dr. Fung, who is a nephrologist (kidney and diabetes doctor) and founder of the Intensive Dietary Management Program specializing in type 2 diabetes, explains how people have become obese, what is it and what we can do to cure it. Dr. Fung surprised me when he explained that obesity is not about people not able to regulate their calories in and calories out, but it is caused by a hormonal imbalance. The culprit is the hormone insulin, the storage of sugar and fat hormone. Dr. Fung argues that insulin is like a gatekeeper in 2 compartment storage system. You have a refrigerator and a freezer. The refrigerator is where you store glycogen aka sugar for quick access while fat is stored in the freezer. Insulin is the gatekeeper that prevents you from accessing the fats in the freezer while bringing more sugar from the fridge to be stored in the freezer. In this cycle of overeating sugar and eating more frequently, people tend to have high levels of insulin for a period of time. This in turn, creates insulin resistance within the body and as a causal effect, makes the body increase production of insulin thereby making you more fat. The current methods of treating obesity are lacking as studies have shown that by decreasing the amount of calories you intake, you decrease your caloric expenditures. Simply your metabolism slows down because your body seeks to be in a homeostasis and isn’t going to let you die off. Dr. Fung uses the analogy of a coal power plant. Say you were burning on daily 2000 tons of coal. Suddenly, you receive 1500 tons. Do you still burn 2000 tons? No you reduce the amount you burn otherwise you risk burning through your stores and have the power plant shut down and create chaos and havoc to our mobile connected youth! Your body works the same; the less calories you intake, the less you burn. That is why the calorie theory of “Eat Less, Move More” does not work. What has shown to be correct is the Hormonal Obesity Theory and how sugar is the root cause of obesity. Sugar is deadly. Sucrose and especially fructose increase insulin levels and over time give rise to the American obesity epidemic. Its considered “empty calories” that contain very few nutrients and promote overconsumption (when has a kid ever asked for a second plate of broccoli vs. a second slice of cake?). Dr Fung informs the reader that Fructose is “The Most Dangerous Sugar” and has found its way into majority of the processed food available. Artificial sweeteners are not better, if not worse even for you, as they too raise insulin levels without having a calorie count. I love when he asked the reader, “Consider all the people you see drinking diet sodas. Do you knowanybody at all who said drinking diet soda made him or her lose a lot of weight? Anybody at all?” P174. There are couple videos on Youtube of Jason Fung worth watching. It isn’t as comprehensive as his book but can get you started: The Aetiology of Obesity and Therapeutic Fasting — Solving the Two-Compartment Problem. So if the calories in, calories out model doesn’t work, what does? You’ve probably already guessed it, its proper eating and especially, Intermittent Fasting. Why is IF so effective in curbing insulin and getting the body to lose weight? We know that refined carbohydrates leads to increase in the production of insulin and cortisol thus eating a low-carb, high protein or fat diet makes sense right? Unfortunately not so; “The biggest problem with high-protein diets was that they didn’t really work for weight loss. But why not? The reasoning seems solid. Insulin causes weight gain. Reducing refined carbohydrates lowers blood sugar and insulin. But all foods cause insulin secretion.” (189). Obesity is a multifactorial disease. What we need is a framework, a structure, a coherent theory to understand how all factors fit together. Reduce your consumptions of added sugar (anything processed has added sugar). Reduce your consumptions of refined grains. Increase your consumption of natural fats. Increase your consumption of fiber and vinegar. Eat wholesome natural and unprocessed food while drinking plenty of water, coffee or tea. In regards to when to eat, Dr. Fung simply has one word,fasting. Fasting is completely different from starving. As Dr. Fung explains,“Starvation is the involuntary absence of food. It is neither deliberate nor controlled. Starving people have no idea when and where their next meal will come from. Fasting, however, is the voluntary abstinence from food for spiritual, health or other reasons. Fasting may be done for any period of time, from a few hours to a few months.”(237). “Fasting is the greatest remedy- the physician within.” — Paracelsus, founder of toxicology and one of the fathers of modern western medicine. When you fast, you prevent insulin from increasing for an extended period of time. It forces your body to switch over to burning fat stores for energy and improves insulin sensitivity. “Most diets restrict the intake of foods that cause increased insulin secretion, but don’t address insulin resistance. You lose weight initially, but insulin resistance keeps your insulin levels and body set weight high. By fasting, you can efficiently reduce your body’s insulin resistance, since it requires both persistent and high levels.” (240). Dr Fung follows up on how hormones adapt to a fasting state and debunk myths about fasting. He believes that anyone and everyone can learn to fast and makes life simple.“This is the ancient secret. This is the cycle of life. Fasting follows feasting. Feasting follows fasting. Diets must be intermittent, not steady” (248). Remember my goals? I am pleased to say that on the morning of September 11, I’ve reached the weight of 147 lbs/66.7 kg and my debt has been paid off. I now need to write new goals! I’m enjoying life and have never felt better. The mental change I’ve made allowed myself to be happy knowing I am aiming for better things in life. I cant wait to ride on October 1st for the Levi Gran Fondo. When friends wonder what my secret formula or recipe to achieve this weight loss, I tell them, months of research and testing, healthy eating and living. Often times, that answer doesn’t seem to satisfy them and I am expected to share a sort of secret formula. I tell them the formula that worked for me is: low stress + sleep + Paleo diet + Intermittent Fasting + exercise (I heard that HIIT works well too). But in reality, what you need is motivation, perseverance and a desire to go from Unhealthy to Healthy.